If you're traveling to the small, Central American country of Honduras for the first time, you're probably curious about what is Honduran food like. Luckily, Honduran food isn't that different from food in the United States—with a few notable exceptions. In addition to the information provided here on food and drink and Honduras, you can take a culinary tour of Central America through these articles which explore the food and drink of every Central American country. A typical Honduran breakfast usually consists of scrambled eggs, boiled or refried black beans and lots of tortillas. Locals like to have it with some local coffee. "American-style" breakfasts are commonly available in most Honduran restaurants. These often include a toast with jam and coffee or orange juice. A typical meal in Honduras usually includes rice, beans, tortillas, some kind of grilled meat such as chicken, pork or beef, and a salad. You will find some variations on the Caribbean coast or in the Bay Islands. In this region seafood and coconut products dominate the local cuisine. No travel taste test of Honduran food is complete without fresh fish, shrimp, lobster or the endlessly versatile conch (caracol in Spanish). In the larger Honduran cities like Tegucigalpa, San Pedro Sula, and La Ceiba, big American restaurant chains are cropping up with increasing frequency. So you will feel at home. Don't be surprised to find T.G.I. Friday's, Pizza Hut, Kentucky Fried Chicken, and even Cinnabon. However, if you made the decision to visit a new country you'll probably want to try the foods that make that country unique. You can get burgers and pizza at home. This list of some of the most representative dishes of Honduras that are found on most mid-day and evening menus. Burritas are shredded meat, refried beans, cheese, and avocado rolled up in flour tortillas. These are different from Mexican burritos. Tamales in Honduran cuisine may include vegetables or potatoes as well as chicken or pork. Beware before you bite, as bones are sometimes left in the meat. Even if you have tried them in other Central American countries it's recommended that you try them in Honduras too. The recipes vary from country to country. Pastelitos de Carne (translates as little meat cakes) are deep-fried flour pastries filled with meat, rice and/or potatoes. Sometimes they are served with homemade tomato sauce. Anafres is a traditional Honduras appetizer comprised of hot black beans and cheese, served with chips. 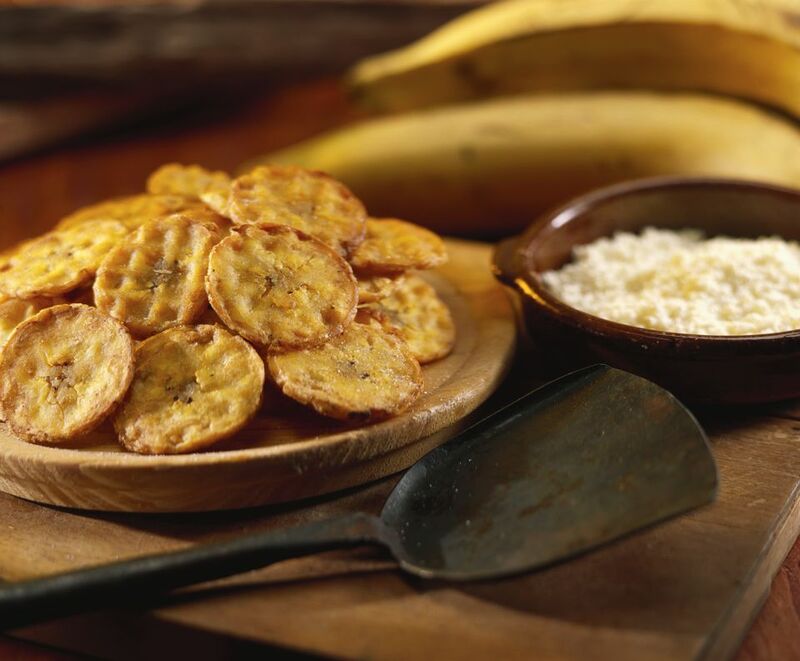 Tostones are crunchy deep-fried plantains, an indispensable side dish in Honduran cuisine. The dish is also known as platanos fritos and is most common for breakfast and dinner. Ceviche is a dish of chopped raw fish, shrimp, or conch mixed with onions, tomatoes and cilantro, and marinated in lime juice. Ceviche is served with fresh tortilla chips and is popular in every coastal region but you might be able to find some in the cities too. Tres Leches Cake (Pastel de Tres Leches) is a cake soaked in three kinds of milk, including evaporated milk, sweetened condensed milk, and cream. Most of the time the cake comes with powdered cinnamon on top. Arroz con Leche is rice soaked in warm milk with sugar, cinnamon, and other spices. It's also known as Honduran rice pudding. The thicker it is, the tastier. Popular Honduran beer brands are Salva Vida, Port Royal, Barena, and Imperial. Guaro, a sugar cane liquor, is popular in Honduras. If you're daring, you might seek out some Giffity, a fiery Garifuna rum-based liquor. Gifiti is made by soaking roots and herbs in rum and is traditionally made by the Garifuna people who live on the Caribbean coast. In mainland Honduras, food is cheaper than that of other nations in Central America. Expect Honduran food to be more expensive in the Bay Islands of Utila, Roatan and Guanaja, where almost everything (besides seafood!) must be shipped in.